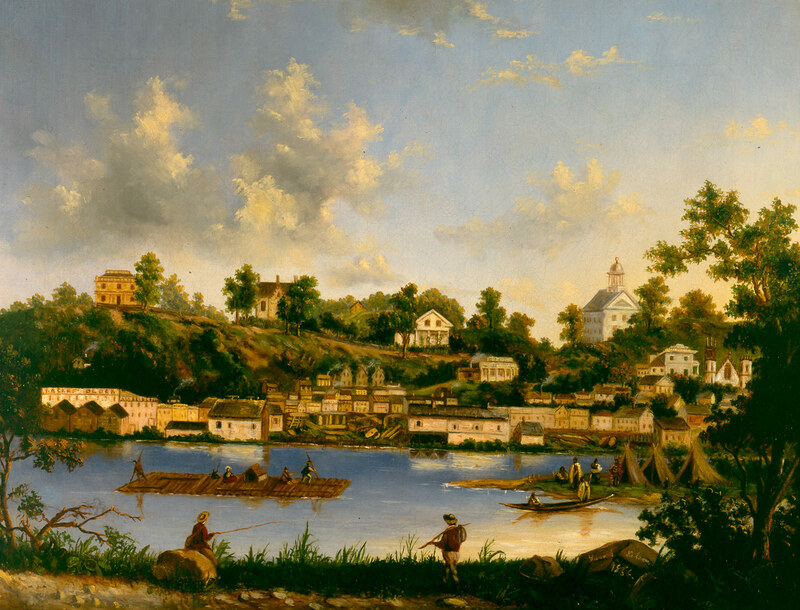 Scene of early Grand Rapids viewed from the west side of the Grand River looking east. The raft in the river may have special significance as Sarah’s father, James M. Nelson, was the first person to use a raft of logs to reach the mouth of the Grand River. Some liberties were taken with the location of the island where Indians, a canoe, and teepees are depicted. Warehouses and commercial buildings line the eastern shore of the river. Large homes are on the hilltop as is the Old Stone School on the right with its bell tower visible. Smaller houses are clustered lower on the hillside. Two young people are fishing from the west riverbank. Sarah’s name and the date, 1856, are on the rock in the lower right corner of the painting. The only building depicted that still stands is St. Mark’s Cathedral, shown farthest to the right with two towers. Sarah Nelson was sixteen in 1856, and her teacher was Marinus Harting, a professional artist from the Netherlands.